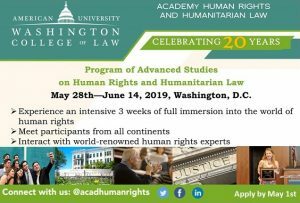 The Program gathers more than 150 participants from more than 25 different countries with different levels of professional experience, all in Washington D.C. for an intensive 3 weeks of full immersion into the world of human rights. 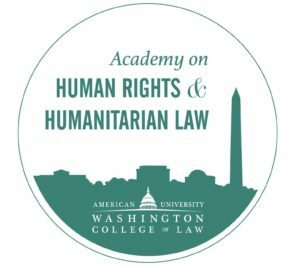 Through this Program, the Academy on Human Rights and Humanitarian Law provides the unique opportunity to learn and interact with judges of the International Criminal Court (ICC), the International Court of Justice (ICJ), Special Rapporteurs and Committee members of United Nations, members of the Inter-American Commission on Human Rights, experts from prominent NGO’s, and professors from all over the world. First application deadline: 1 May 2019.